Leader of the Sicarii, the remnant of whom, driven from Jerusalem about 70 by Eleazar b. Ananias, retired to Masada. 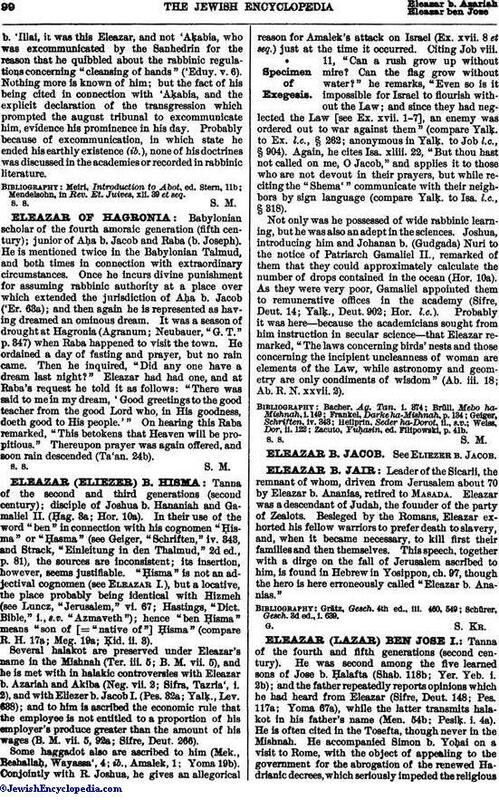 Eleazar was a descendant of Judah, the founder of the party of Zealots. Besieged by the Romans, Eleazar exhorted his fellow warriors to prefer death to slavery, and, when it became necessary, to kill first their families and then themselves. This speech, together with a dirge on the fall of Jerusalem ascribed to him, is found in Hebrew in Yosippon, ch. 97, though the hero is here erroneously called "Eleazar b. Ananias." Schürer, Gesch. 3d ed., i. 639.